This dress was bought in 2016. I had the sudden urge to look at it one day and realized it was Ivory and not White like I had wanted. Many months and calls with David's Bridal later, I ended up buying another one in White which is the one I wore in my wedding. And now I have this unworn dress in Ivory that needs to go! It's never been worn except to try on. It's been hanging in my closet in a garment bag ever since I received it. It was originally a size 16 but after alterations I'd say it's closer to a 14 now. It also has 5 bustle points on the back. 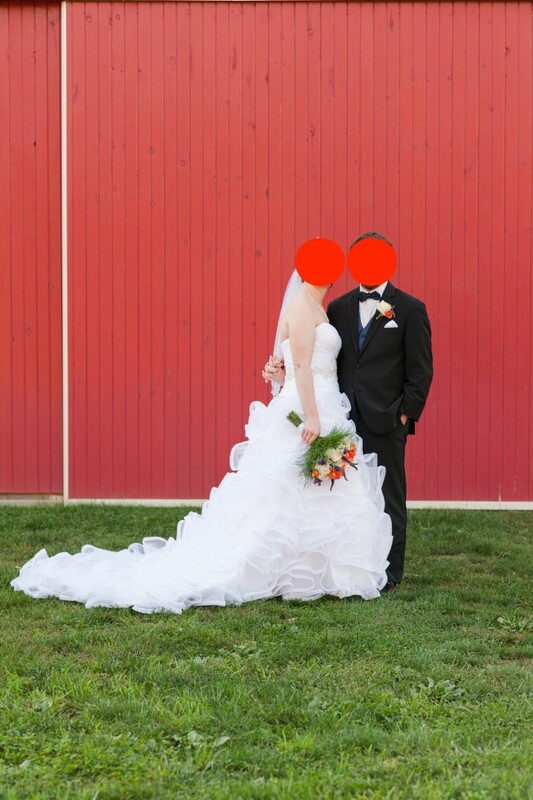 ***NOTE*** The dress in the picture of my husband and I is the White dress at our wedding. That is NOT the dress that is being sold here. I just wanted to show the train. The dresses are EXACTLY the same except for the color. The one being sold is the Ivory that has never been worn.